A gin appreciation society has been left with a sour taste in its mouth after falling foul of advertising regulators. 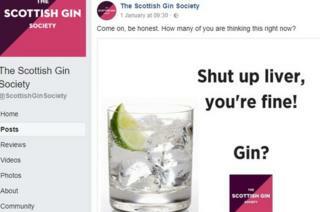 Complaints over 10 "light-hearted" Facebook posts by the Scottish Gin Society (SGS) have been upheld by the Advertising Standards Authority (ASA). It ruled the ads encouraged excessive drinking and implied alcohol could lead to sexual success, among other things. SGS claimed the posts were memes and therefore were not in ASA's remit. It added it was "the most po-faced, fun-free, nanny-state judgement imaginable". The ASA had been alerted to a number of Facebook entries, seen around the turn of the year, by Aberdeenshire Alcohol and Drug Partnership. The authority ruled three of them encouraged excessive drinking. One featured an image of a glass of gin and tonic accompanied by the text: "Shut up liver, you're fine! Gin?" The image featured the SGS logo and was captioned: "Come on, be honest. How many of you are thinking this right now?" Another post read: "I only drink gin on two occasions: When I'm thirsty and when I'm not thirsty". Two other posts were found to have contravened rules covering nutrition and health claims made on foods. One read: "This gin and tonic has 91 calories. A banana has 105 calories. My doctor told me to make the healthy choice. I love my doctor." A further four posts were found to have implied alcohol had therapeutic qualities and could enhance physical and mental capabilities. One referred to gin as being able to "settle nerve disturbances and period cramps", while another featured the text "gin distilled for the eradication of seemingly incurable sadness". The ASA acknowledged the captions had been "presented in a light-hearted tone" but "still implied that gin could help people overcome emotional problems, and treat depression and pain, and that the ads therefore suggested that gin had therapeutic qualities and could help to treat health conditions". The gin society had argued its Facebook posts did not fall within the remit of the ASA as they did not sell or promote any products or receive income from the sale of third-party products. But the authority said it considered the posts were subject to advertising rules, because they were "directly connected to the promotion of the Scottish Gin Society's membership service and the intention to sell gin, which was therefore directly connected to the supply of Scottish gin". A spokesman for SGS said: "The ASA freely admits in its judgement that these posts were light-hearted and humorous and they aren't even adverts - nor did we write them. "They were re-posts of funny memes to members by a not-for-profit organisation so shouldn't fall under the ASA's remit. "We completely support responsible drinking, but if this is justice then I am a Long Island iced tea." SGS, which is sponsoring the Scottish Gin Awards in Glasgow later this month, said it would be nominating the ASA for the "Humour Bypass Award".